Yum! 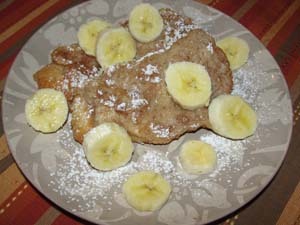 We are really excited to have this vegan french toast recipe from The Curly Haired Chica. Thanks so much for sharing! 1. Mix all ingredients (except bread) together in large bowl. 2. Dip bread into mixture being sure to cover both sides. 3. Heat skillet and cook slices until golden brown. 4. Garnish with favorite fruit, maple syrup, and powdered sugar (optional). Let us know what you think of this easy vegan recipe: French Toast!